Watch highlights as Red Bull's Sebastian Vettel beats Mercedes' Nico Rosberg and Ferrari's Fernando Alonso to pole position at the Brazilian Grand Prix. 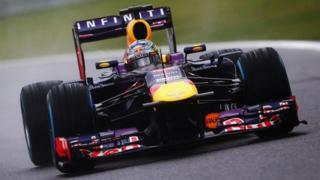 Red Bull's Mark Webber starts his final F1 race fourth, ahead of Mercedes' Lewis Hamilton and Lotus's Romain Grosjean. Toro Rosso's Daniel Ricciardo and Jean-Eric Vergne qualified seventh and eighth with Ferrari's Felipe Massa ninth ahead of Sauber's Nico Hulkenberg.